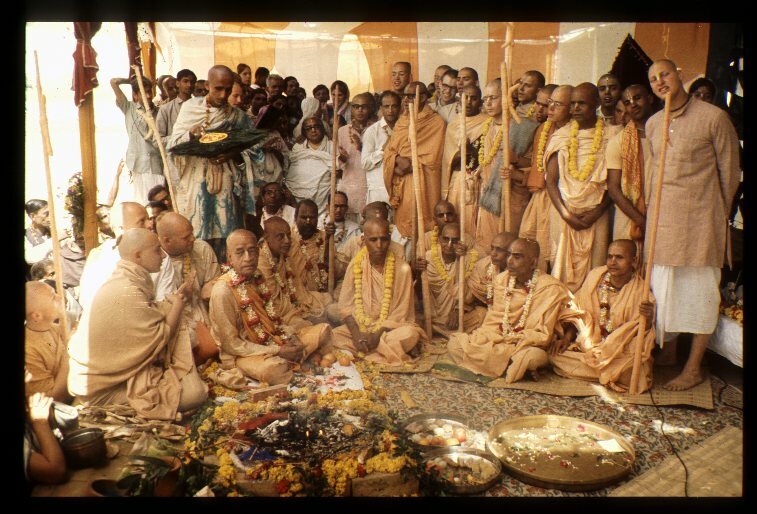 In March 1972, we had the first ISKCON Gaura-Purnima festival in Sridham Mayapur. During that festival, small Radha-Madhava came from Calcutta and were presiding over the program. At that time, only the bhajan-kutir was on the land, so we had a big pandal program. 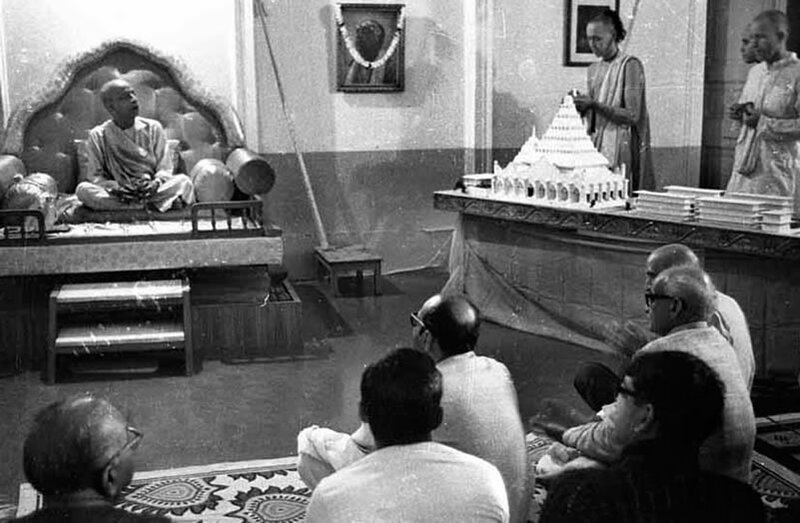 It was in that pandal, either on Gaura-Purnima, or one of the days near it, that Srila Prabhupada performed the foundation ceremony for the Temple of the Vedic Planetarium. 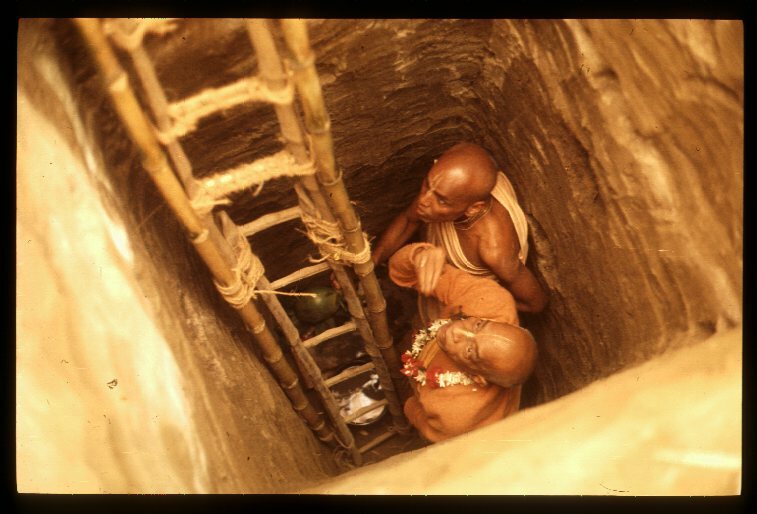 A hole was dug about 15 or 20 feet deep, and Srila Prabhupada personally performed the foundation ceremony and installed the deity of Ananta Sesa. There is a picture of Srila Prabhupada down the hole, and also pictures of the fire sacrifice that was performed. Bhavananda Prabhu was there and Acyutananda Prabhu was there. Srila Prabhupada invited all of his godbrother's and many of them came and they helped with the program. At the end of the ceremony the hole was filled up, and Ananta Sesa is still there in that place. The location of the ceremony was east of the bhajan-kutir on the southern side of our land. It was about fifty meters from the bhajan-kutir. At that time, we had only nine bigas of land, three acres, which was the original plot that Tamal Krishna Maharaja had purchased for Srila Prabhupada. The lotus building was built on one end, and Bhaktisiddhanta road was the other end. Where the long building is now was the northern boundary. Later in 1977, the last time Srila Prabhupada was here in Mayapur, it was presented to him that now we have more land on the eastern side, and it would be a much better location for the temple; not so close to the road and more space. Srila Prabhupada sanctioned that, but he never personally went out to the foundation laying ceremony. That was done on the edge of the little forest that is out near the Gurukula. Srila Prabhupada's disciples laid that foundation and Anantadeva. But that very night, someone actually came and dug up the hole and stole Ananta Sesa. It was a very isolated place at that time. Right now, we just had the ground breaking ceremony with Ambarisa Prabhu and Bhavananda Prabhu. Srila Prabhupada told Ambarisa to fund this temple, there's footage of that, some film, and he has stuck it out all these years and is here right now and is coming up with the money. And I would say that Bhavananda Prabhu probably had more instruction about this Temple of the Vedic Planetarium than anyone else. Because he was always here, he was the co-director of Mayapur and he stayed here for many years while Srila Prabhupada was here. So Prabhupada would often tell him what he wanted. He wanted the temple with a big dome and the chandelier inside, the universe should be moving. There should be escalator, moving staircase. He gave the height and everything like that. He instructed Bhavananda that he wanted big Radha-Madhava and asta-sakhi, and Panca-tattva should be there, seven feet tall. And also Srila Prabhupada wanted a parampara altar. So he was telling so many things to Bhavananda about the temple. And Bhavananda is here after so many years. It seems like the original people that Srila Prabhupada entrusted with this work, somehow or another they have come together and it is starting to happen after all these years. The plans and contemplations are going on in different phases, now when Caitanya Mahaprabhu will be pleased it will be taken up. So even we had the money, still the sanction of the Supreme Lord is needed. Without His sanction nothing can happen. So it looks like the will of Lord Caitanya is there now. The land is cleared, the model is accepted, test piling has begun. Everyone is in agreement, at least all of the authorities. It is happening now, the desire of Lord Caitanya is there. This is a very auspicious time, and historically important also. Finally, after all of these years, this temple is being built. There are predictions given in the Sri Navadvipa-dhama-mahatmya. Lord Nityananda Prabhu told Srila Jiva Goswami that after Mahaprabhu leaves, the Ganga will come and flood the whole area for a hundred years. Then for the next three hundred years, the Ganga will move around and all the pastime places get washed away. Then He said, after that, again the task of revealing the dhama will begin again in earnest. So that corresponds to exactly the time when Srila Bhaktivinoda Thakura was here and he rediscovered the birthplace of Lord Caitanya. Then Nityananda Prabhu says many bathing ghatas will be built on the Ganga, which we are seeing happening now. 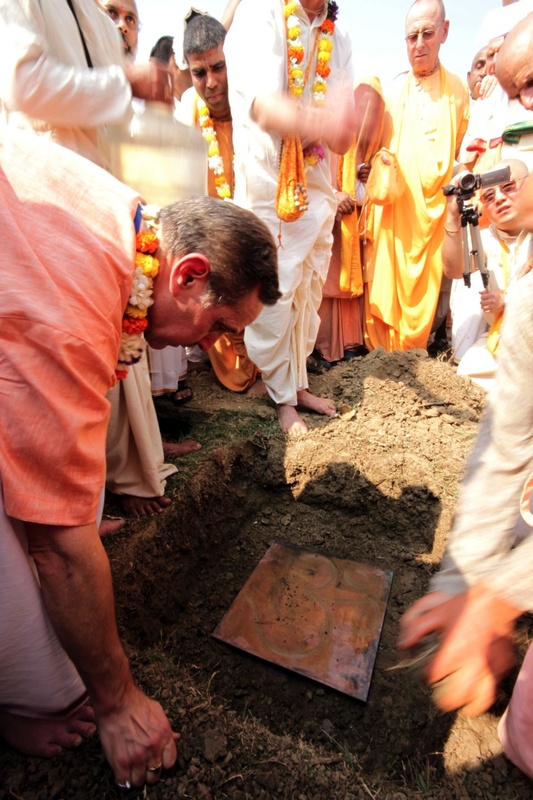 Just a few days ago, I think it was the day of the ground breaking ceremony, we received confirmation from the Ministry of Tourism that they will spend several crores of rupees to build a nice ghata where Prabhupada's ghata is. This is to promote tourism; bringing people by speed boat from Calcutta and other places. They were going to build it at some other location, but when they saw that everyone is coming to ISKCON anyway, they said if you give us the land we will do it for you. So this also seems right on time, and everything appears to be very auspicious. This is the prediction of Nityananda Prabhu, so it is happening. ...I would say that Bhavananda Prabhu probably had more instruction about this Temple of the Vedic Planetarium than anyone else. Because he was always here, he was the co-director of Mayapur and he stayed here for many years while Srila Prabhupada was here. And Lord Nityananda also says that many residential buildings will spring up in Mayapur. This we are seeing also. As soon as you come to Mayapur you can see. Hundreds of houses are coming up, and they are all devotees. Nityananda Prabhu said they will all have deities in their houses. You go to any of these houses, you will see they all have Jagannatha, Mahaprabhu, Nityananda, or Radha-Krishna. And you will always hear the kértana coming from their houses. So that is another prediction that is happening now. Ambarisa Prabhu is laying one of the large copper plates, with various Vedic signs carved on it, at one of the four corners of the temple construction site. Then Lord Nityananda speaks of this adbhuta-mandira. Prabhupada never mentioned this word adbhuta. But actually he said it in English. Adbhuta means astonishing or wonderful, and Prabhupada did say wonderful. You European and American boys are used to doing something wonderful so go to Mayapur and build some skyscraper. This was his explanation of the adbhuta-mandira. It is a very, very wonderful project. And Nityananda Prabhu said, gauranga nitya-seva haibe vikasa, that from this temple, service to Lord Gauranga will spread all over the world. How do you serve Gauranga Mahaprabhu? By chanting Hare Krishna. This is the main service. He has come to give this, the holy name. So from this temple, the chanting of Hare Krishna goes to every town and village of the world. Prabhupada described it as a flood of love of God. He said in a Sri Caitanya-caritamrita purport, "In Sridham Mayapur there is sometimes a great flood after the rainy season. This is an indication that from the birthplace of Lord Caitanya the inundation of love of Godhead should be spread all over the world, for this will help everyone, including old men, young men, women and children." It will happen from this temple. So we have to build this temple, at least we can do that much. Then it is up to the Lord when the holy name spreads to every town and village. Of course, that is the ambition of every devotee in ISKCON, or at least it used to be. We are just longing for that day. This is our ambition, our dream. Srila Prabhupada said that actually this temple already exists, Bhaktivinoda Thakura saw it. He said the Lord desires something, and by His iccha-sakti it automatically becomes manifested. But it exists spiritually. Bhaktivinoda Thakura could see. But we have to go and put the bricks and cement and everything. We have to build it up. Prabhupada said that just like Krishna showed Arjuna on the battlefield that He had already killed everyone, but Arjuna had to go out and fire his arrows and be the instrument. In that way he would get the credit. So Arjuna did that, and became the hero of the battle of Kuruksetra. So Prabhupada said in the same way, you have to go out and build this temple. If you don't do it, somebody else will go out and build it later on, and they'll get the credit. But better that you build it and get the credit. Prabhupada gave this instruction to establish this temple, and we can expect it to happen. It is all happening according to the predictions given. Most probably, this is one of the greatest preaching projects of our time. Following in the footsteps of Srila Bhaktivinoda Thakura, who established the first temple in Sri Dham Mayapur, we expect everyone to "contribute their mite" for the successful construction of Mahaprabhu's temple.